When my parents came to visit after Bennett was born my mom, Bennett, and I went shopping at Buy, Buy Baby in Brandon, Florida. Mom was very generous in purchasing several items for Bennett. Of all those items I absolutely luve the frog bathluve she purchased. 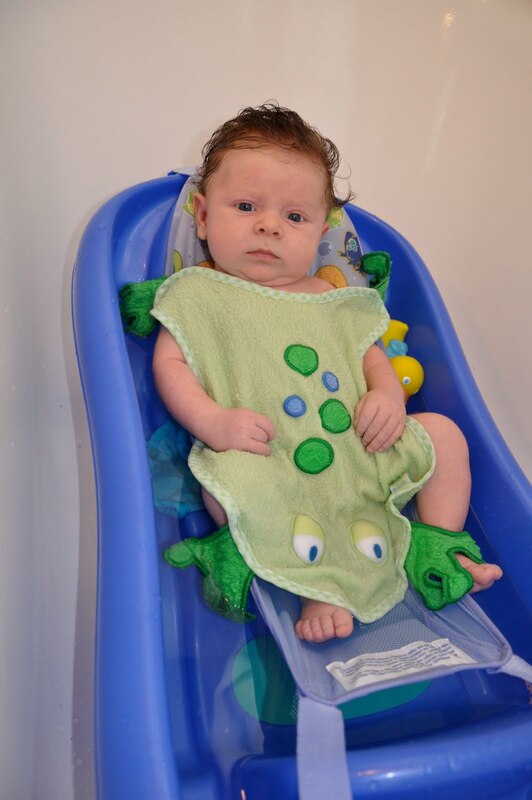 It is super cute and keeps him warm from head to toe while bathing versus a normal wash cloth that barely covers his chest. Amy Seckinger is the creator of this wonderful product known as bath luve. Read her story here. Amy has been kind enough to send me a PINK FISH BATH LUVE to GIVE AWAY to one reader. 2. For an extra entry, let me know in a separate comment that you are or have become a public follower of my blog. I will announce the randomly selected winner Wednesday, June 9th. If you are not the winner I recommend heading over to the Bath Luve website and purchasing one for yourself. You won't regret it and neither will your little tyke!! Leave Amy a comment and tell her Amber sent you. Yes!!!! I'm lovin' it!!!! Sadie is obviously too big for this, but this would be perfect for the next one (we're 95% sure it's a girl!)!!!! I remember Sadie's first bath was so scary...I had no idea what I was doing. But it soon became a fun time as she learned to enjoy the water and we got some good cuddles in with her soft, neked self! I'm looking forward to that again with the next kid! Love this! So cute - Bathtimes are the best "smile times" We love them in our house!! And there is NOTHING like a nekkid baby! Love them! Katherine Taylor (Kate) was born Friday, May 21. We've been sponge bathing but will get the ok to do a real bath after our next pediatrician's appointment. We're awaiting her first bath with excitement and anticipation, because she likes sponge baths! 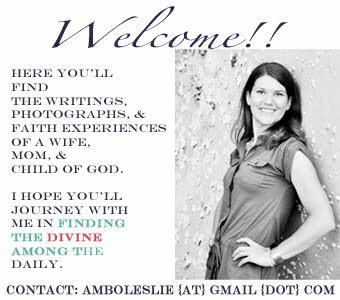 I love reading the blog, Amber, especially now as a fellow new Mom. It's a wonderful way to keep in touch. We miss you at our BSF leaders meetings. Oh, and this is from Jessica Hastings! This is too cute and we would of course love one for Corin. I loved giving our girls baths but and most times they enjoyed it. They did have crazy amounts of hair at birth (just like Bennett) so it took FOREVER to wash their hair:) I am of course a "follower" of your blog but I have not technically joined as a follower of any blog. And we love bath time around because (1), there is nothing cuter than a naked baby (or "naked nudie bootie" as we call it around here), and (2)Javen loves to play in the bath tub so much that for a while - before it was warm enough to go to the pool - we were taking a couple of baths a day just for the fun of it! 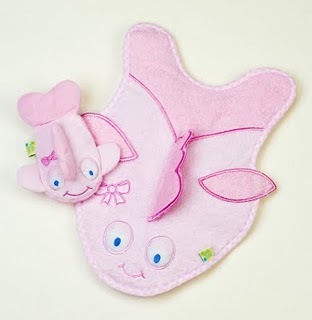 So the bath Luve towel etc looks so adorable & such a great mix of practical/cute! As far as bath time goes, my favorite part so far with my first is his excitement over bath time. He's always loved it & the moment "bath" is mentioned he's racing to the tub! Secondly, in anxiously awaiting our daughters birth I'm so excited to see how my little man will protect and take care of her. I can't wait to see my little helper in action with his little sister. Love following your blog!! I look forward to every post! This is so perfect! I'm having my second girl and I love bathtime, but the new kids always get so cold it doesn't last nearly long enough for me. The bongding during that time is so good, and dad get's to participate too! I love seeing my baby's wet hair go all curly! Look at all of your comments! :) Bathtime is always fun for Kendra, and so I am hoping that Bailey likes it just as much! I guess we'll see. So fun!! Thanks for sharing!! I've never seen one of these and in addition to Jayne, I have two close friends having girls in the next week! My favorite part of bathtime is definitely the towel wrap up at the end when she goes from shivering to cuddling and all I can see is Jayne's little wet head, and then we cuddle and smile at eachother in the mirror! Bath time has become an adventure. Granted it has only been going on for a couple of weeks now, it gives me the perfect chance to bond with my "Baby Girl" for daddy-daughter time. Since my wife handles all of the feedings, I really do not get a chance to have that closeness that she gets. Bath time gives me a chance to let my baby girl know that I am there to wash away all of the events of the day to make room for new adventures tomorrow and that I will be there to keep her warm and comfort her. It reminds me that we are all vulnerable and need someone to hold us close at times. BTW, Shawnda has been a follower for a while and now I have started.